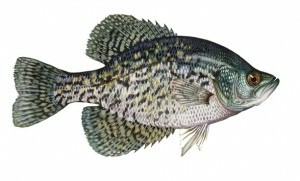 Catching spring crappie is a great way to spend a nice spring afternoon or evening. The key to finding spring crappie is to find the type of water that is holding them. The best places to start looking for spring crappie would be: wood, weeds, rocks, or possible some bridge pillar. Once you find what the crappies are holding on start looking for other places that look like the place you found. Minnows seem to be the most consistent bait and will give you the best success in catching good numbers of crappie. In clear water you will want to make sure you are using light weight fluorocarbon line or at least a fluorocarbon leader. The rig of choice would be a slip bobber with a jig and minnow or a minnow on a split shot rig. A great place to start if you are just starting out is to go out and get a book about crappie fishing. Here is one of the best crappie book I have ever read, Crappie Fundamentals. Good luck and have fun. Fishing has always been a passion of my. I have been fishing since I was old enough to walk and still have the same, anytime any place attitude about going fishing. In 2005 I started fishing some local bass tournaments, Butler BassCasters Wednesday Night tournaments, Local Opens, and a few K.B.B.C tournaments. It has been a great experience and I have learned a lot from the guys I fish with.